E1 – Exemplify professionally-informed, growth-centered practice. Teacher candidates develop reflective, collaborative, professional growth-centered practices through regularly evaluating the effects of their teaching through feedback and reflection. This means that teachers are making reflection a regular practice to improve instruction and student learning. In the Internship Seminar class we were asked to provide a student survey about our teaching practices. I already ask students to provide feedback at the end of each unit. My piece of evidence is another type of survey I incorporate into my regular teaching practices. 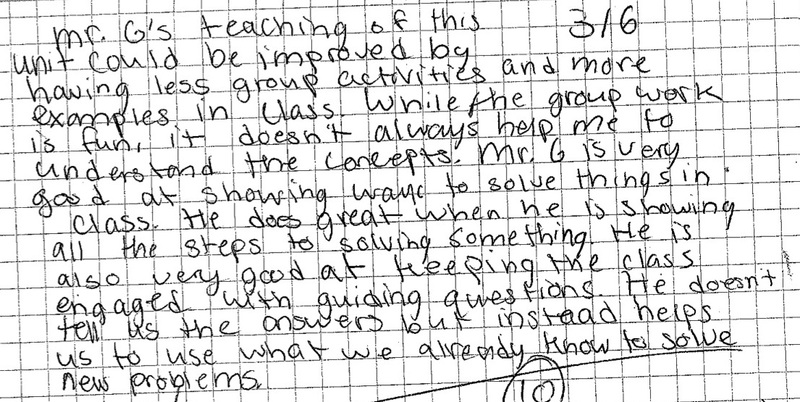 After students take a unit test, I ask my students the following question to respond in their reflection journal: “In what ways can Mr. G improve the teaching of this unit?” This response was particularly representative of the whole classes responses and provided constructive feedback with positive behaviors to continue. When this student wrote this reflection, I saved it because their feedback was helpful to me, both positively and constructively. This student’s reflection about my work as a developing teacher, demonstrates my growth in my teaching practices throughout the year. The student says, “He does great when he is showing all the steps to solving something. Her is also very good at keeping the class engaged.” Both of these have been points of emphasis as I begin my teaching career, particularly keeping students engaged in rigorous academic work. Research shows that keeping students engaged improved retention of material (Borich, 2014), I am excited that students recognize my efforts to keep them engaged in learning. I will continue to ask students these and similar questions to receive feedback that I can improve upon (such as improving group work protocols to optimize student learning when working in small groups). This student work sample, along with my reflection to the assigned student survey, that aims at different teaching practices, help me target areas of success and areas of improvement. I can ask specific questions to measure my effectiveness as an educator. “In mathematics, several factors have been consistently found to exert a positive influence on student achievement gains: teacher coursework, degree attainment, and certification coupled with pedagogical training in how to teach mathematics (Hightower, et al., 2011, p.32 ).” Teachers play a crucial role in student achievement, the improvements I can make directly impact the student’s success. In the past, since I have asked the same static question at the end of each unit, I would like to get more diverse feedback. As I work with the Knowles Science Teaching Foundation, I will be developing a long-term teacher inquiry questions for the first several years as a teacher. As this question develops and I work in collaborative work groups to help me establish steps towards meeting these professional goals, I would like to use the student surveys to ask my students questions as evidence towards those goals. The student feedback will help me assess if I am meeting my practitioner inquiry goals and can help me find next steps in any are needed. Borich, G. D. (2014). Effective Teaching Methods (9th ed.). Upper Saddle River, NJ: Pearson Prentice Hall. Hightower, A. M., Delgado, R. C., Lloyd, S. C., Wittenstein, R., Sellers, K., & Swanson, C. B. (2011). Improving Student Learning By Supporting Quality Teaching. This entry was posted in E - Exemplify service to the teaching profession, E1 - Exemplify professionally-informed, growth centered practice and tagged Goals, professional development, professional goals, student feedback, Student Learning, survey, teacher, teaching practices. Bookmark the permalink.